Peerless CMJ450 Suspended Ceiling Plate consists of a 24"(610mm) x 24"(610mm) ceiling tray suspended by four tie wires from the true ceiling above with a fifth "safety cable" is also provided. The 1-1/2"-11.5 NPT fitting accommodates an extension column or projector mount. Peerless CMJ453 Suspended Ceiling Plate consists of a two piece 24"(610mm) x 24"(610mm) ceiling tray that offers up to 5 diff points of mount attachment. 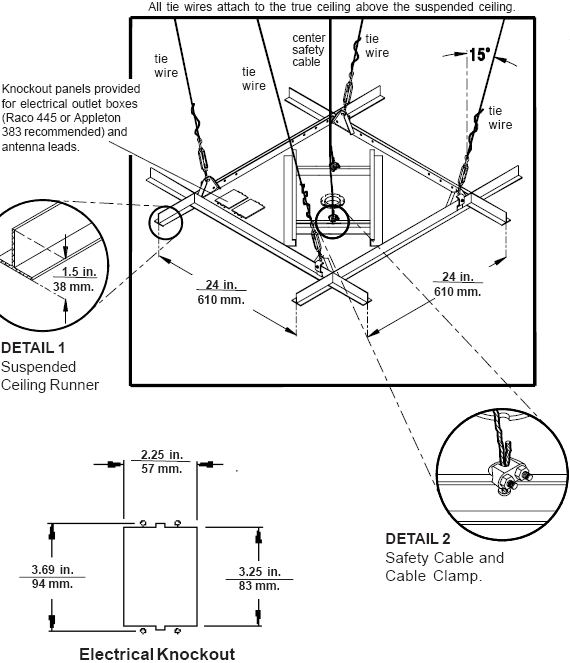 The unit is suspended by four tie wires from the true ceiling above and a fifth "safety cable" is also provided. The adjustable 1-1/2"-11.5 NPT fitting accommodates an extension column or projector mount.